Indoor art retreats offer time and space for indulgence in restorative experiences of creativity and beauty. ArtSpa afternoons and evenings occur monthly, and may also be scheduled for private groups. Group size is limited and pre-registration is highly recommended. Healthy, tasty snacks and tea will be provided. January’s ArtSpa focuses on clarifying our intentions for this new year. We will create mandalas on plates to invoke and expand the presence of whatever we are calling forward in our lives. February’s ArtSpa supports our love for ourselves. We will make a small, portable shrine as a visual reminder of what we are holding closest to our hearts. 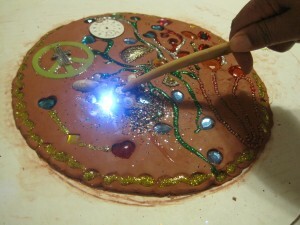 March’s Art Spa nurtures the seeds that we are growing. We will create healing environments that include living plants to support our own healthy growth. April’s ArtSpa celebrates our blossoming beauty! We’ll indulge in flower foot baths and adorn mirrors with reminders of our loveliness, inside and out. Register for ArtSpa. Please email or call me at 510-414-9728, with questions or for more information.